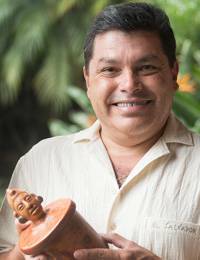 Oscar Rodolfo Mendoza celebrates the art of the ancient Maya with the original design of this ceramic vessel. Decorated with a jaguar's head on the lid and classic glyphs on the body, the vessel is crafted by hand with the same ceramic techniques developed by the Maya Pibil people. Little is known about them, other than that the Pibil were a warrior and migrant community that came to El Salvador from Mexico. This vessel is treated to achieve an antiqued look, featuring red and orange hues obtained from achiote seeds. 20 cm H x 11.2 cm Diam.